← Ready on the right? Mike Branson behind the rifle. I replaced the solid forend on the Anderson Mfg. 20″ rifle with a lighter ventilated Midewest Industries part. 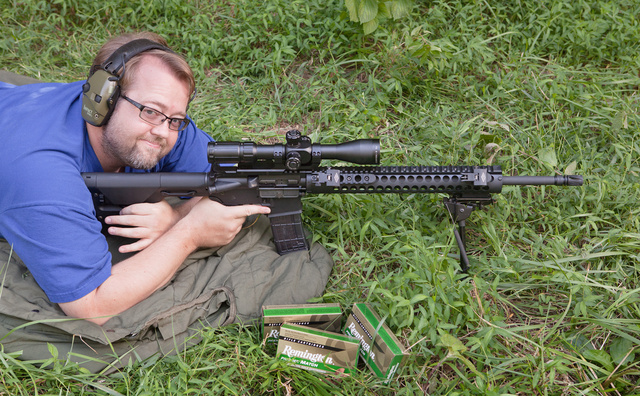 Today, I re-zeroed the rifle with the new Primary Arms 4-14x FFP scope. All four shooters took turns with this rifle. I am not a great rifleman, so this 75-yard target is fairly good for me. 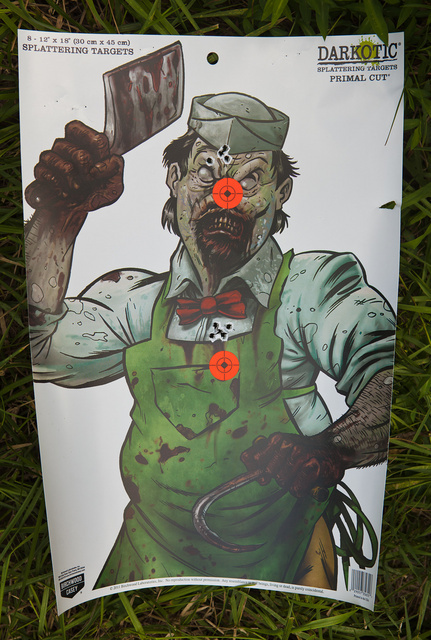 This was shot with Remington 69-grain match. I did a few better groups but always pulled at least one shot far to the side. My friend Glenn left several of these targets with me and I am a fan. The PA scope is sharp and clear. Zoom and parallax rings are a bit too tight, but that’s ok. The mount is exactly the right height for an AR15. Close focus is excellent. It’s a little less bright than the Nightforce 3.5-15x and lacks reticle illumination. The eyebox is fairly small. I am not used to working with FFP scopes, but given my preference for hold-overs vs. adjusting turrets, it should work better than RFP versions. For the 1/8 of the Nightforce price, it looks like a pretty good buy. The rifle ran 100% with all ammo except Tula. I had to cycle 24 of 30 rounds of that manually. Tula 45ACP and 308Win ran fine for me, but their 223 seems pretty weak. Remington match ammo (62/69/75gr) and Mike’s 77gr handloads gave groups about half as big as 55gr ball. This entry was posted in ammunition, interesting people, rifle, training, weapon and tagged 223, Anderson Mfg, AR15, optic, primary arms, range, scope. Bookmark the permalink. Very accurate rifle. Shooting conditions were not ideal. If shot from a bench with good rests, this rifle should shoot sub 1/2 MOA with right ammo.